happy and healthy living in city of angels! 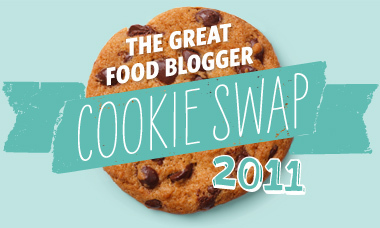 so as you all know, i recently participated in the first annual food blogger cookie swap. and, after a very long, stressful afternoon in the kitchen, i came up with my recipe to send to my matches. using a base recipe for "monster cookies," i made some additions and changes after several attempts and three batches. here's the final list of ingredients and instructions on how to make your own chocolate chip fluffernutter oatmeal cookies! In a large bowl, cream the butter and both sugars until fluffy. Beat in the eggs one at a time and then add the vanilla. Add peanut butter and mix until smooth. Mix in four until just combined. Stir in oats and chips into dough with a wooden spoon. Drop the dough by heaping tablespoonfuls onto greased baking sheets, about 3 inches apart. Push in 4-5 marshmallows into each cookie dough ball. Bake for about 12 minutes, until golden. Be sure to chill dough in the fridge in between batches so it stays firm enough to form into doughballs! **best when warmed in a microwave (unless eating immediately after baking). i hope my cookies were enjoyed by ari over at ari's menu, emmarie at bananas and beer, and amy at two true foodies! i'd also like to thank sarah, alissa and jenny for these delicious cookies! all in all, this cookie swap was so fun. i mean, who wouldn't want to get cookies in the mail?! surprise cookies, no less. and now i have a ton of new cookie recipes to look through as well as new food blogs! i'm so glad i participated and i can't wait to do it again next year! Fun! I wish i would have gotten in on a cookie swap! I did a blogger secret santa.. but who doesnt like cookies?! 2 ingredient chocolate pumpkin microwave cake. grain bowls - 2 ways. coconut crusted tilapia with avocado mango salsa. fluffernutter oats [and packing for home]. restaurant weekend/a lack of cooking.